Participate in our Active Maintenance Programme by keeping up with regular exams and cleans and enjoy the benefits of a white smile – for life. All Australian private health fund participants with rebates can maintain healthy smiles with no-gap coverage for check-ups and cleans. We accept all qualifying children with CDBS coverage for basic dental care with no-gap coverage up to $1000 over two years. Treatment plans start from $49 per week. As we are locally owned, you will always get to see your dentist, and we do enjoy getting to know our patients and their families. Our team is passionate about making each appointment a positive experience for you and your family. We offer an expansive range of services for patients of all ages, from preventive to restorative and cosmetic dentistry options. You will find detailed explanations of some of the most common questions from our patients. Find out valuable information for both current and new patients who are headed to the clinic. Welcome to Toothsavers Dentists, your Mount Annan general and family dental practice. 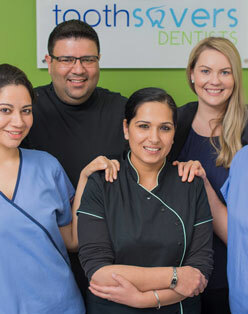 Our dentists, Dr Amrinder Singh Thind, Dr Gurvinder Kaur Dhamija and Dr Nikita Randhawa, have dedicated themselves to providing reliable, high-quality dentistry to the families of Mount Annan, Narellan Vale, Blairmount, Currans Hill and the surrounding neighbourhoods. Our dentists’ passion for oral health and creating beautiful smiles shows with every patient interaction. We look forward to welcoming you. Just because we use the latest technology to provide exceptional dentistry to our patients does not mean that we have replaced the personal touch you find at Toothsavers Dentists. The relationships we build with our patients are still the most rewarding aspect of working in dentistry. Because we do not answer to corporate mandates, our dentists are free to take their time with patients and listen to their needs and goals, helping us gain a greater understanding of your oral health and how to customise your care. We invite every member of your family to become part of our dental family. From your child’s very first dental visit to looking after our most senior patients, our individualised approach to dentistry empowers patients to make informed choices as their oral health needs change over the course of their lifetimes. Just as patients experience changes in their overall health, dentistry reflects the wellness of the entire body. Patients who need extra attention, such as those with diabetes, expecting mothers and patients who lose dexterity because of arthritis, will get the treatment they need to stay in optimum oral health in spite of their current medical conditions. We have implemented the latest technology into our practice with the goal of improving the quality of dentistry we provide in addition to making every patient experience comfortable and efficient. Our dentists are CEREC-certified and highly skilled at creating natural-looking, durable dental crowns in a single visit. Not only does this eliminate weeks of waiting time, but it also means that patients receive crowns designed by our dentists who ensure quality throughout the process. At Toothsavers Dentists, our dentists work with all health funds and accept a variety of payment options, including payment plans. We never want financial limitations to come between you and a healthy smile and will work with you to make a comfortable, beautiful smile a reality. If you or your family want a dental clinic where you can feel like a valued friend, we invite you to get in touch to arrange a time to come by and meet our friendly and professional team. Their warmth and gentle approach to dentistry put even our most nervous patients at ease. We can’t wait to see your smile.